Anna University will be conducting the Tamil Nadu Engineering Admissions on behalf of the Tamil Nadu Government. 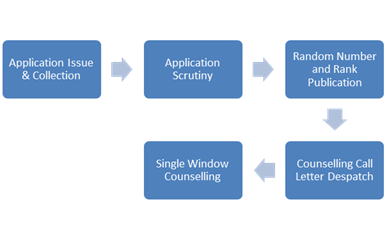 TNEA 2014 this year would be conducted through a Single Window Counselling process. This is being done so as to achieve a transparency system in the admission process of engineering aspirants to the engineering colleges of Tamil Nadu. Tamil Nadu Engineering Admissions for the 2014 session will be conducted for engineering aspirants wanting admission in B.E./B.Tech courses in the state of Tamil Nadu by Anna University. The admission for TNEA starts with the issuing of the applications forms. Anna University will be issuing the TNEA applications which are expected to start around the second week of May but it may differ based upon the publication of the Class XII results. All the engineering aspirants who wish for an engineering seat in the state of Tamil Nadu need to obtain this application form from their nearest application issuing venue and submit it duly filled. The application form includes a coding sheet, application form, instruction booklet and list of all engineering colleges booklet.